Hi, I’m Rachel, a raw foodie and ethical vegan living in the beautiful city of Bath in Somerset UK. I love creating decadent raw desserts because I think they’re a fun way to show what it is possible to create from relatively simple, unprocessed foods. I share my recipes because I want to show people that adopting a vegan, plant-based lifestyle does not mean you have to give up eating delicious food, and that eating a diet of mostly fruits and vegetables, with a few raw desserts thrown in for good measure, will fuel the soul and the body. 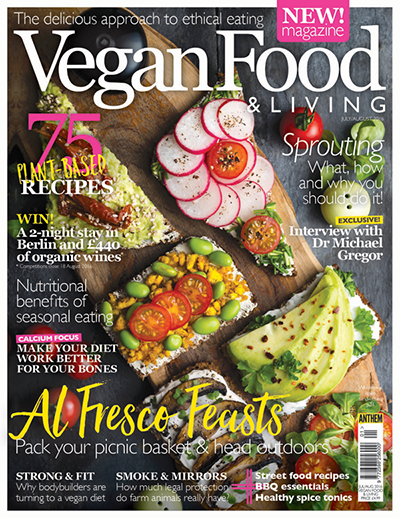 I am very lucky to be working in my dream job as the digital editor, content editor and face of the fabulous Vegan Food & Living magazine, and I am so grateful to have been such a fab platform through which to spread the vegan love from! We put a whole lot of love into each issue, and if you want to get your hands on a copy, you can subscribe here, or pick up single copies here. Or just come and say hello to us on Facebook! Since adopting a plant-based diet over 6 years ago, my perspective on life, and our purpose in life, has been changed for the better, and has given me a brighter outlook and a deeper connection to the beautiful planet we are so lucky to live on. I believe eating a predominantly raw diet helps you to appreciate nature in all it’s forms in a much deeper way, and this ultimately makes life more enjoyable. I first paid attention to what I ate during my second year of my undergraduate degree, after neglecting my health in favour of a student lifestyle. To cut a long story short, my boyfriend’s stepmother introduced me to the raw food, vegan lifestyle, something I had never even heard of before, and I just fell in love with it. I love how beautiful the food looks on the plate, the amount you can eat, and the way it makes you feel. Since adopting a plant-based lifestyle I feel I have become calmer, happier and more appreciative of ‘the smaller things in life’. In terms of my everyday diet, on a day to day basis I eat a whole foods plant-based vegan diet, and my breakfast usually consists of raw fruits and berries with heaps of leafy greens, whilst dinner will includes lots of beans and pulses, and a whole lot of potatoes, rice and pasta. If you’d like to get in touch with me outside of the blog, you can find me on Instagram or Facebook, or send me a message through my contact page. I also use Bloglovin’ if you’d like to follow my posts there. I really like getting to know my readers, and am really open to suggestions for recipes, ideas, or feedback you have, as I believe learning from each other is the best way to grow creatively, so come chat to me anytime!